The baby fell in the synagogue and suffered intracranial bleeding. Her father, an ambulance driver and a friend who is a paramedic, sedated and ventilated the baby and rushed her to Hadassah. The nightmare scenario of every parent – the baby falls out of their hands. This was the experience of Jerusalem resident Chavi, who took her seven months old daughter, Ayala Shira, to the synagogue for Rosh Hashanah. The baby slipped out of her mother’s hands, fell to the ground, and injured her head. Fortunately, her father – a MDA volunteer ambulance driver, was on call. 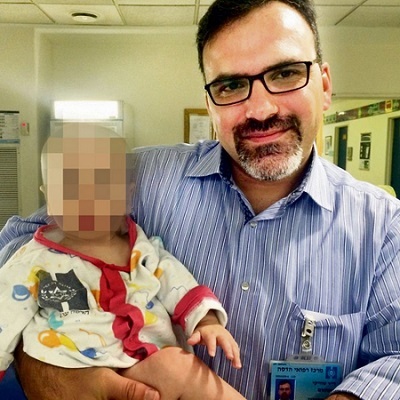 He recognized that the child was convulsing and he rushed her in the ambulance, together with a neighbor who functions as a paramedic, to Hadassah’s Ein Kerem hospital. “I never dreamed in my wildest dreams that I would use my own ambulance to rush my youngest daughter to the hospital”, said the father, Shmaryahu, 30 years old. He arrived at Hadassah with his daughter already sedated and ventilated, and she was taken to Neurosurgical intensive care. Ayala Shira had an intracranial hemorrhage – Subdural hematoma – that puts pressure on the brain. Urgent surgery to open the skull to drain the bleeding was performed. The surgery lasted three hours. The baby’s recovery was impressive, and she was released with no neurological damage. “With the end of Yom Kippur we learned we are going home. For us, it’s nothing short of a miracle”, the father recounted.